Former Sudanese President Jaafar Nimeiri, who brought Islamic law to the country, has died at the age of 79, government officials say. Mr Nimeiri died after developing "an illness", presidential assistant Magdi Abdel Aziz said. He did not provide any further details. Mr Nimeiri came to power in a 1969 coup that ended years of civilian rule in Africa's biggest nation. He later became a close US ally before being ousted, also in a coup, in 1985. "He was too ill to be taken out of the country for treatment," Mr Nimeiri's secretary Makkawi Ahmed was quoted as saying by Reuters. The funeral would be held on Sunday in Omdurman, near the capital Khartoum, officials said. After seizing power in 1969, Mr Nimeiri gradually shifted from being a left-wing admirer of Egypt's late President Gamal Abdel Nasser to becoming a US ally. During his time in office, the first civil war between the Muslim north and Christian and animist south was brought to an end. 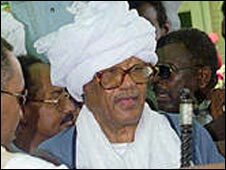 In 1983, he introduced Islamic Sharia law to Sudan - a move which many analysts say triggered a fresh north-south conflict. Mr Nimeiri's rule was also marked by a severe economic crisis in the late 1970s and early 1980s, that was compounded by Sudan's huge foreign debt and political upheavals. There was a short period of democratic civilian rule after he was ousted in 1985, but the army under current President Omar al-Bashir seized power in 1989, backed by Islamist hardliners. Mr Nimeiri returned to Sudan in 1999 after spending 14 years in exile in Cairo, Egypt.